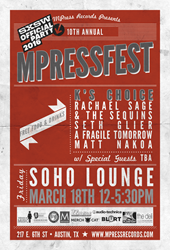 NYC-based indie label MPress Records celebrates 10th Official SXSW Day Party with performances by Rachael Sage & The Sequins, K's Choice, A Fragile Tomorrow, Seth Glier, Matt Nakoa & special guests. Sponsored by Audio-Technica, Women in Music and Elmore Magazine. MPress Records is proud to present its 10th official SXSW party, MPressFest, named a “Winner” by SXSW Examiner. The party takes place at Soho Lounge in Austin, Texas on Friday, March 18th at 12:00pm and features an exceptional line-up including Rachael Sage & The Sequins, Seth Glier, A Fragile Tomorrow, K’s Choice, Matt Nakoa, and special guests. Sponsored by Audio-Technica, Women in Music, Elmore Magazine, MerchCat, M Music & Musicians Magazine, Blurt Magazine, Planetary Group, Almighty Retail, The Deli Magazine and Independent Music Awards; the event is open to the public. Entry, food and drinks are free, but you must RSVP here: bit.ly/MPFSXSW16. In today’s ever-shifting music landscape, it’s remarkable for anything to happen more than three times in a row, never mind ten – but that’s exactly what is going to happen in Austin this March, as New York City-based indie label MPress Records presents its 10th “MPressFest” SXSW Official Day Party at the Soho Lounge on 6th Street. The event will also double as the official industry launch of Rachael Sage’s forthcoming album “Choreographic”, due May 20th. MPressFest SXSW 2016 @ SOHO Lounge (217 E. 6th Street, Austin, TX) Friday March 18th. Doors open at 12:00 PM, and music starts shortly thereafter. Cocktails and a luscious spread of delicious and healthy food featuring vegetarian options will be served along with tons of great giveaways. Audio-Technica will be giving away SonicSport in-ear headphones to the first 50 people to check into the event & Women in Music organization will be giving away a 1-year membership! The event is first-come first-serve, food and drinks are free & it is open to all, but you need to RSVP. Please visit bit.ly/MPressSXSW2016 to RSVP. Stay tuned by liking MPress Records on Facebook. Featuring Seth Glier, A Fragile Tomorrow, Rachael Sage & The Sequins, Matt Nakoa, K’s Choice and special guests TBA! Sponsored by: Audio-Technica, Women in Music, Elmore Magazine, MerchCat, M Music & Musicians Magazine, Blurt Magazine, Planetary Group, Almighty Retail and Independent Music Awards. For further information, or to request a press pass, interview or media kit, please contact melanie(at)mpressrecords.com.